How to improve short term memory loss? Short-term memory loss is a case of losing memory over a short period of time. In most situations, long-term memory is not impaired. While most people associate short-term memory loss with aging and specifically dementia, there are other causes for amnesia-like symptoms; therefore, treatment is varied. People who experience short-term memory loss might find that they can still remember how to play their favorite instrument, recall the names of everyone they have met, and what schools they attended, but they may not be able to remember what they were doing five minutes ago. There are cases where it is possible that brain damage has completely destroyed short-term memory. People often say they are “stuck” in a certain time period because they have a hard time forming new memories. There are a number of reasons for short-term memory loss. It could be attributed to a medical condition, an injury, or other influences. Short-term memory, which is also referred to as primary or active memory, is essentially memory that is generated over a period of 30 seconds to several days. Since short-term memory needs to be recalled in a lesser amount of time, the brain’s ability to store short-term information is more limited. Short-term and long-term memory occurs in different areas of the brain. Short-term memory is the function of the frontal lobe of the cerebral cortex. Long-term memory is held in the hippocampus and then moves to areas of the cerebral cortex that are involved in language, as well as perception, for permanent storage. People have to keep re-learning items in their short-term memory to keep them active. If information is not processed or rehearsed in the brain immediately, then it fades away quickly. With long-term memory, information is permanently recorded, and a person’s ability to retrieve the information depends on different cues. It is also interesting to note that short-term memory and long-term memory are different when it comes to the type of information being stored. For example, short-term memory usually stores physical qualities of an experience. This includes, what we see, what we do, what we taste, what we touch, and what we hear. Long-term memory storage is based on its meaning and semantic codes. Semantic codes are a specific type of encoding in which the meaning of a word, phrase, picture, or event is encoded, as opposed to the sound or vision of it. The easiest way of gauging short-term memory loss is to turn to the broad definition, which is: not being able to remember things that happened recently. Having said this, there are specific signs of short-term memory loss that can indicate that you or someone you care about require medical attention. Most of us have been guilty of forgetting a name from time to time, so there is no need to rush off to the doctor’s in these situations, but if forgetting names happens regularly and other signs and symptoms develop, it may be cause for concern. What causes memory loss and forgetfulness? 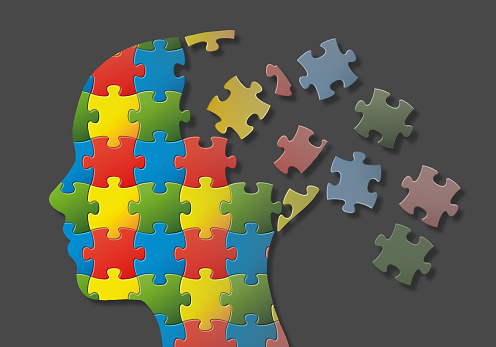 Short-term memory loss is a primary feature of dementia or Alzheimer’s. This is the kind of cognitive decline that usually occurs with aging. When a person has short-term memory loss due to Alzheimer’s disease or dementia, there can be sudden memory or attention deficit. People should look out for symptoms such as lack of concentration and a change in personality. Stress: Too much cortisol (stress hormone) along with adrenaline can impact cognitive skills, including memory. Stress management techniques help a lot of people reduce the amount of daily stress in their lives. Distraction: Since there are so many stimuli around us and so many people are fighting for our attention, it is easy to forget things, such as appointments. We can also forget if we are too focused or worried about one specific issue. Aging: If you are middle-aged or older, you may find that you are forgetting more often. When we are fully grown, our brain stops producing new brain cells. This means, those that start to die off do not get replaced and we have less to work with. Staying active and challenging yourself with memory tasks can be helpful. Smoking, poor diet, and alcohol consumption are known to contribute to age-related cognitive decline. Excessive drinking: A syndrome called “Korsakoff” is a type of dementia that can be brought on by excessive alcohol consumption. This can occur at any age and is most prevalent in people who are alcoholics. Brain damage: In extreme situations, damage to the brain can cause memory problems. Infections, a tumor pressing on a certain part of the brain, or trauma to the head could be to blame. Medication: There are several different medications and treatments that have the potential to cause memory loss. Chemotherapy is one treatment that can cause alterations to the brain. If you have started new medication and notice that it is harder to concentrate or you are more forgetful than normal, seek medical attention. The brain is an intricate organ so if you are experiencing short-term memory problems, it could take some time to determine the cause. When testing for short-term memory loss, doctors will generally review one’s medical history and ask several questions to evaluate a person’s memory and general mental status. After this simple testing, exams may involve blood tests to check for different possible conditions, including thyroid disease and vitamin B 12 deficiency. Depending on the results of the initial short-term memory loss test, the doctor may suggest an MRI or CT scan of the head be conducted, or an EEG be done to measure electrical activity in the brain. In some cases, a cerebral angiography is ordered to examine blood flow in the brain. When short-term memory loss is related to psychological trauma, a specialist such as a social worker or psychologist may be suggested. How to improve short-term memory loss? Humans generally follow the same path – when something is important to us we work hard at it. It is safe to say that we all want to maintain a good short-term memory, but it takes work. We can ignore our precious brains or take short-term memory exercises into consideration. Those who already suffer from short-term memory loss can improve their memory with short-term memory loss treatment and exercise. Below we outline some easy to follow tips to maintain and improve short-term memory. Use mnemonics: Attach a word, phrase or image to an object. For example, “Thirty days hath September, April, June, and November…” is a mnemonics trick that many people learned in school to remember how many days are in a month. Try memory games: Put a number of objects on the table, give yourself 30 seconds to memorize them, and then take the objects away. Try to write down on a piece of paper the names of as many objects as you can remember in 30 seconds. You can also try crossword puzzles, Sudoku, and general reading. Maintain order: Keep everyday items, such as car keys, in the same place and do things in the same order all the time. Write it: Always write information down. Keep a diary: A journal will remind you about daily tasks. Set alarm: Use an alarm to help you remember to do something. Avoid distractions: Try to do one task at a time so that you don’t get distracted. Try concentrating: Avoid thinking about tomorrow or yesterday, but focus on the here and now. Speak aloud: Repeating names and facts out loud either to yourself or to someone else can be very helpful when it comes to remembering later on. Chunk: Chunking means breaking up information into smaller and more memorable bits. A good example of this is phone numbers. They usually appear 803-427-3298 as opposed to 8034273298. Social security numbers and zip codes work the same. Go for a walk: Many people who experience short-term memory loss find that taking a relaxing walk and looking at natural scenery can sometimes jog their memory. Practice healthy habits: Developing a brain-healthy lifestyle means getting a good night’s sleep, eliminating stress and simple carbs, as well as eating well-balanced meals. Meditate: Regular meditation has been known to help reduce stress, help with sleep, and help the brain to focus on one thing at a time. When you are trying to figure out how to improve short-term memory loss it is important to first understand the cause of your impairment. This will help guide you in terms of what tips might work best. Short-term memory loss is common in people who experience a stressful episode such as the death of a loved one or the loss of a job. Oftentimes, this kind of memory loss disappears quickly, but there are cases where treatment of some kind or brain exercises are required. If you think that a medical condition could be contributing to your memory loss or the memory loss of someone close to you, talk to a doctor. In many cases, the remedy can be a simple adjustment to a medication or it could be a health issue that is treatable. The sooner the cognitive problem is addressed, the better chance there is of avoiding permanent memory damage.